Vented? Unvented? What’s it all about? 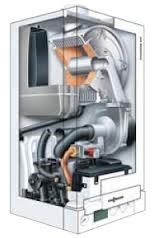 Most people will have heard of a “combi” boiler, maybe even a “condensing combi”, these are technical names for a boiler which supplies hot water on demand. They are idea for small one bedroom houses or flats as they are efficient and cheap to install because they don’t have any loft tanks or cylinders in the airing cupboard. However, where there is a need for a larger supply of hot water a combi will struggle to power a shower and run a bath at the same time. They traditionally only supply about 13 litres of hot water per minute and so if two or three appliances are using the same water source there is going to be a shortage. An excellent alternative is to heat stored water housed in a cylinder and then feed that to the shower and bath. In the old days this was done by gravity using a cold water tank in the loft. These days the cylinders are build to withstand much higher pressures as so the mains water pressure can be used to push the hot water to the taps, bath, shower or where ever its needed. In theory this provides an endless supply of high pressure hot water. This type of system is call an “unvented” hot water cylinder and these are fitted anywhere in the house where there is space. They stand about 6ft (1.8m) high and about 600mm wide. Because they are a pressurised cylinder they can not be fitted by the untrained DIYer or plumber. An unvented qualification is required to fit these cylinders, which we hold at Macoun. Contrary to popular belief these cylinder can be fitted to a combi system and so if you have found that you have run out of hot water, don’t despair, contact us and we will show you how you can have as much hot water as you need. Our office number is 0191 2965849 or text 4heat to 88802 with your email address and we will be in touch.